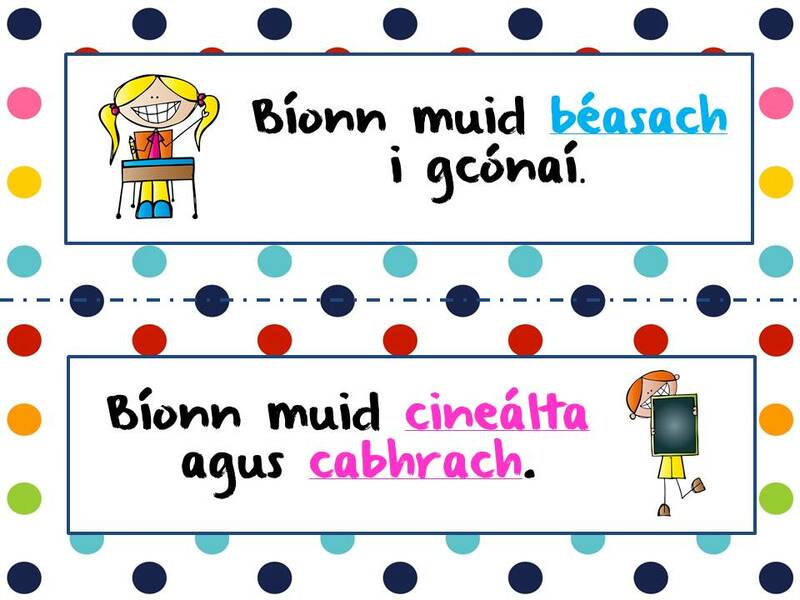 Cé go mbíonn gach múinteoir difriúil, go mbíonn gach páiste difriúil agus fiú go mbíonn gach grúpa páistí difriúil – bíonn orainn teacht anuas le córas ranga a chabhríonn linn bainistíocht a dhéanamh ar dhroch-iompar sa seomra ranga, nó díbirt a chur air más féidir. Is é sin an chéad dúshlán. 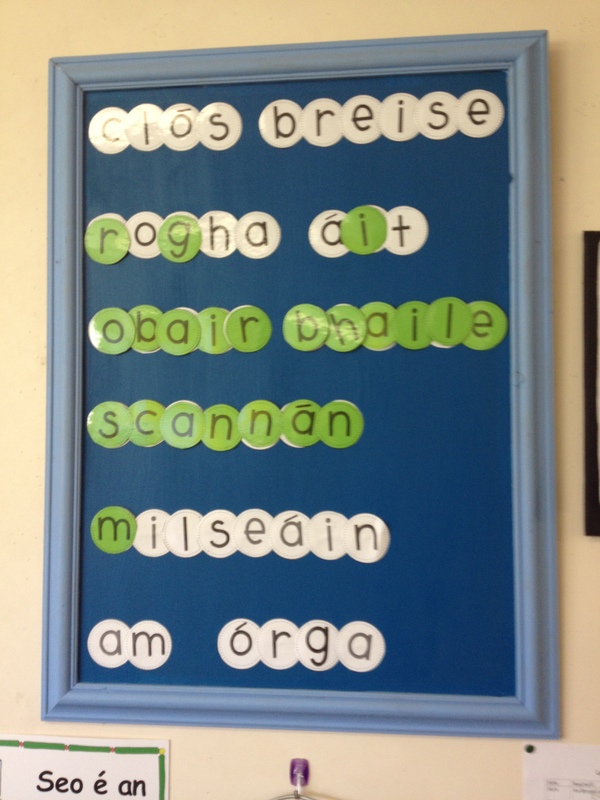 And dara dúshlán, agus an cheann atá i bhfad níos deacra, ná cibé córas atá roghnaithe agat a chur i bhfeidhm – go seasta! Ní anseo ach mo chuid tuairimí féin agus cúpla seift atá úsáidte agam féin i mo sheomra ranga agus gur bhain mé leas astu. While every teacher is different, every child is different, and even every group of children is different – we still have to come with a classroom system which allows us to manage bad behaviour in the classroom, or ideally to eliminate it. That’s the first challenge. The second challenge, and by far the more difficult one, is to implement the system you choose – consistently! This post is simply my own opinions and a couple of methods that I’ve used in my own classroom that I felt were valuable. Córas Ghrúpa nó Córas Aonar?? // Group System or Individual System?? Dar liomsa, tá an dá rud tábhachtach. Dá mbeadh ach córas ghrúpa agat, ní bheadh sé cothrom píonós a thabhairt don rang uilig i gcás mí-iompair duine amháin – agus mar is eol dúinn uilig, is iad na daoine céanna a bhíonn i dtrioblóid go minic! Sin ráite, tá an córas ghrúpa tábachtach chun díreach na daoine sin a mhealladh, chun iad a spreagadh, chun taispeáint dóibh gur baill foirne iad. I think that both are important. If you only implement a group system, it becomes unfair to punish the whole group as a result of one child’s bad behaviour – and as we all known, it tends to be the same people to get into trouble often! That said, the group system is really important to entice and encourage those particular children and to reinforce for them that they are members of a team. Faighim go mbíonn sé i bhfad níos éifeachtaí na páistí a mholadh agus a mhealladh sa chéad áit in ionad a bheith ag cur píonóis orthu nuair a bhriseann rudaí síos. Roghnaím cúpla duais gur féidir le gach éinne sult a bhaint as, agus ansin is féidir leo iad a bhuachaint. Mar atá le feiceáil sa phictiúr seo – nuair a thaispeáineann siad dea-iompar, buann siad litir. Nuair atá na litreacha uilig in aon duais bailithe acu mar ghrúpa, faigheann siad an duais. Bíonn seo an-éifeachtach go deo. I find that it’s more effective to praise and encourage the children in the first place than to punish them after things have broken down. I choose a few prizes that they can all enjoy and then arrange that they can win them. 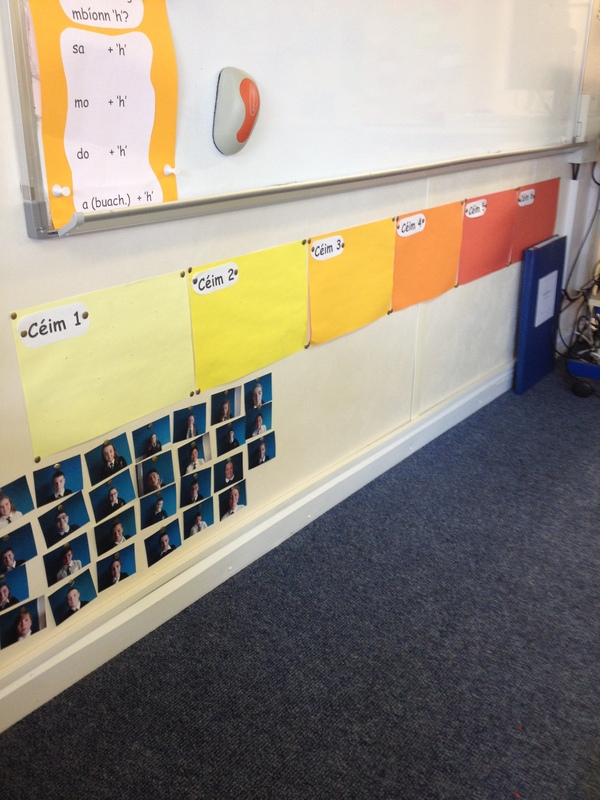 As you can see in the picture – when someone displays good behaviour, they win a letter and choose its placement. When all of the letters in a particular prize have been collected as a group, they win the prize. This is really effective. Tárlaíonn seo i dhá bhealach difriúil i mo sheomra ranga. 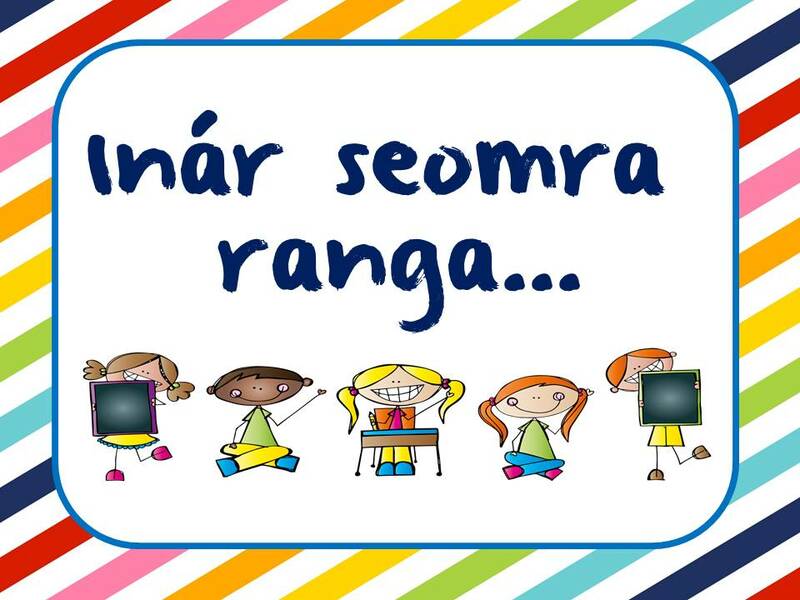 Ar an gcéad dul síos, tá córas scoile ann – córas atá i bhfeidhm i ngach seomra sa scoil, go dtuigeann na páistí, agus atá soiléir agus cothrom. Tá céimeanna 1 – 6 ar an mballa agus nuair a léiríonn páistí droch-iompar bogann siad ó chéim go céim. Is rabhadh ó bhéal atá i gceist le Céim 1 suas chomh fada le cuairt ar an bpríomhoide agus litir abhaile agus iad ag Céim 6. Tosaíonn rudaí úr gach maidin. Ní bhíonn orm mórán úsáide a bhaint as an gcóras seo chun an fhírinne a rá, toisc an dara iarmhairt a bhíonn ann. Bím ag léamh os ard don rang go laethúil – i gcónaí díreach i ndiadh am lóin. Is breá leis na páistí seo agus ní bhíonn siad pioc sásta cailliúnt amach air – fiú caibidil amháin. (Is féidir léamh faoin léitheoireacht seo, agus na buntáistí a théann leis, anseo). Tá a fhios ag mo pháistí má bhíonn orm labhairt leo níos mó ná uair amháin faoin iompar céanna – go mbeadh orthu cailliúnt amach ar léitheoireacht an lae sin. Ní raibh rud ar bith eile chomh éifeachtach dom riamh. Consequences happen in two different ways in my room. Firstly, we have a school system – one that is implemented in every room in the school, one that the children fully understand, one that is clear and fair. There are Steps 1 – 6 on the wall and when children display bad behaviour they move from step to step. Step 1 is a simple verbal warning with the consequences growing more severe with each step – Step 6 being a visit to the principal and a letter home. Everybody begins fresh each morning. I don’t need to make use of this system very much at all, to tell the truth, because of the second consequence I have in place. I read aloud to my class every day – always first thing after lunch. The children love this and are not a bit pleased at even the threat of missing it – even a single chapter. (You can read about this read-aloud time, and its benefits, here). My students know that if I have to speak to them more than once about the same behaviour – that they will have to miss that day’s reading. Nothing has ever been so effective for me before. Úinéireacht ar na Rialacha – nó an Rúin iad? // Ownership of the Rules – or are they Resolutions? Creidim gur cheart go mbeadh na páistí lárnach sa phróiséas – ag tús na bliana – agus na rialacha ranga á scríobh, cé gur féidir linn iad a stiúradh sa treo cheart!! 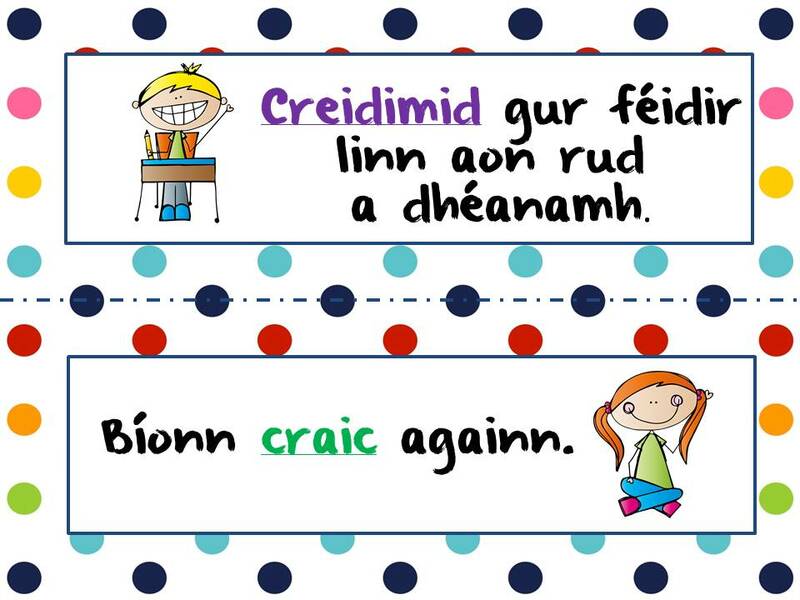 Má scríobhann siad na rialacha, agus má aontaíonn siad ar chéard is dea- nó droch- iompar, bheadh níos mó measa acu ar an gcóras. Níos tábhachtaí arís, dar liomsa, ná go mbíonn muid ag tabhairt faoi Rúin Ranga in ionad Rialacha Ranga i mo sheomra. 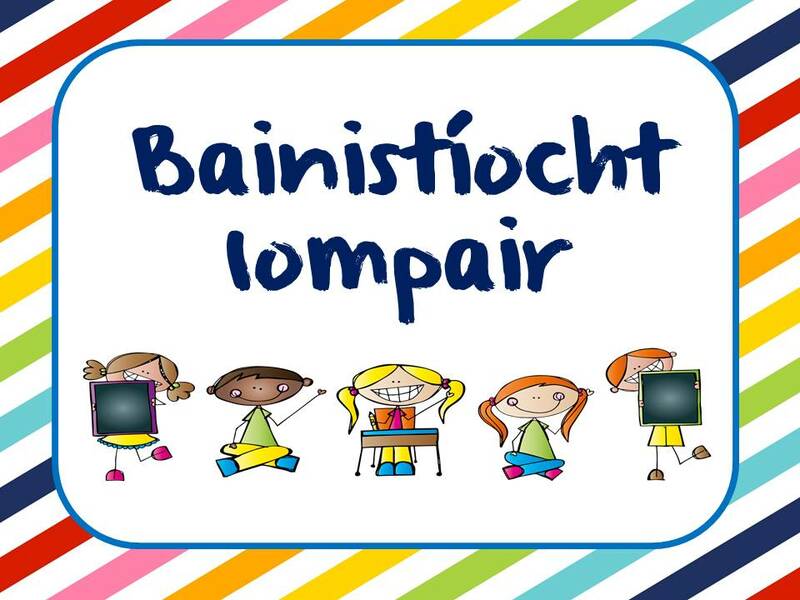 Labhraíonn muid faoi na rudaí a dhéanann muid, na bealaí cearta tabhairt faoin iompair ar scoil. Cuireann muid béim ar na smaointe dearfacha seo in ionad a bheith i gcónaí ag tabhairt faoi na rialacha diúltacha. Seo nasc do na Rúin Ranga a bheidh á chrocadh i mo sheomra i bliana. Is féidir iad a cheannach – ní ach $2.50 atá orthu – tríd mo shiopa ar TpT. I believe that the children need to be part of the process – at the beginning of the year – in compiling the classroom rules, though we can of course steer them in the right direction!! If they write the rules, and if they agree on what constitutes good or bad behaviour, they will have more respect for the system. More importantly again, in my opinion, is that we deal with Classroom Resolutions rather than Classroom Rules. In my room, we speak of the things that we do, and the right ways to behave at school. We emphasise these positive ideals rather than always referring to the negativity associated with rules. Here is a link to the Classroom Resolutions that will be hanging in my classroom this year. You can purchase them – they’re only $2.50 – through my store on TpT. Ba bhrea liom bhur dtuairim agus smaointe a chloisteáil. An bhfuil seift ar bith eile in úsáid agaibh atá éifeachteach? I’d love to hear your opinions and ideas. Do you have any other ideas that are really effective?